Try tackling these Von Miller fantasy football names if you were lucky enough to draft this sack specialist in your league. This Denver Bronco’s linebacker burst onto the NFL scene after playing college ball at Texas A&M. He’s a five time All-Pro selection and was the 2015 Super Bowl MVP. His fun personality shined when he was invited to compete on Dancing With the Stars – he and his partner finished in 8th place. 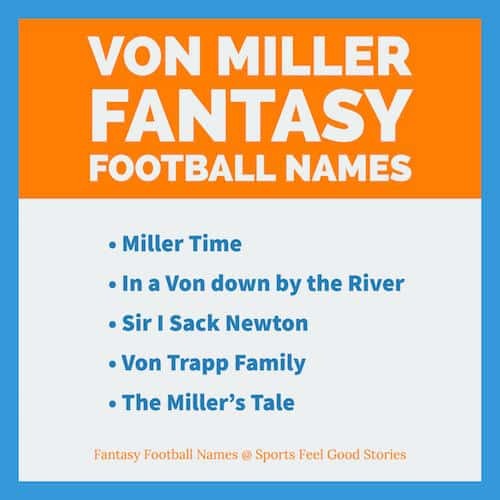 Check out these Von Miller fantasy football team names. In a Von down by the river. MoVon On Up to the East Side. What type of farm does Von Miller own? A chicken farm. Having majored in poultry science at Texas A&M, it’s only logical that he’d be in the chicken business. • As a high profile athlete who wears eye glasses, it was a natural that Miller established Von’s Vision to help Denver-area children with eye examinations and eyewear. His foundation partners with national and regional eyewear retailers and provides a citywide vision day for low-income Denver youth. • Fantasy football scoring is predominantly an offensive affair. In most fantasy football scoring systems, defenses can score points, but it’s hard to get noticed as an individual. When a defensive player merits a list of his own fantasy names, you can probably count on him being a game changer. And, that’s exactly what Von Miller is on the football field. In the 2015 Super Bowl, he dominated the game with sacks and creating a turnover.